Understand the features and benefits behind the new prescriptive thermal value requirements in the 2012 I-Codes and how these requirements support increased building sustainability. Identify the basic types of roof and wall assemblies covered by the I-Codes and how prescriptive thermal requirements are calculated for each assembly. Understand how the CEIR / PIMA Roof and Wall Thermal Design Guide is organized and how building professionals can use the guide to better understand the thermal design standards of the 2012 I-Codes. Gain proficiency in using the guide to determine prescriptive roof and wall thermal values for typical roof and wall constructions. The advancement of the levels of insulation matches the awareness and activities taking place, not just in the US, but across North America and the world. Energy efficiency and the subsequent reduction of energy use is paramount in the building industry. Additionally, reduction of energy use by upgrading insulation amounts in our commercial and residential buildings also has significant co-benefits. Comfort and saving money are important to building occupants and owners. Added comfort in a commercial building means increased productivity and happier occupants, and that can mean higher occupancy rates. Upgrading our existing building stock (e.g., improving the energy efficiency of roofs and walls) means numerous jobs are produced, and many of those jobs are local. Improving your building improves the local economy. There is less stress and more security of our energy grid. Using less energy to do the same amount of work (e.g., heating and cooling our buildings) means less need for additional utility infrastructure, reduced peak loads, and extends our use of precious natural resources. Using less energy reduces our pollutant output which is better for humans and the environment. Buildings account for 40 percent of the US’s carbon dioxide emissions, 18 percent of nitrogen oxide emissions, and 55 percent of sulfur dioxide emissions. Human health is affected by pollution; energy efficient buildings help reduce pollution and therefore improve the health of the human population. It’s important to understand why it is so important to build better building envelopes - whether for new construction or renovations - so our focus is not lost. And, it’s also important to understand that improvements in our building envelopes can provide very significant secondary benefits for the occupants and owners of buildings. Although these advancements in energy efficiency are critical to the design of the next generation of sustainable buildings and renovation of our current stock, the number of new options may be confusing to the non-expert. For starters, the I-Codes now embrace two separate levels of thermal performance: a minimum code level in the IECC and an above-the-code level in the IgCC. In addition, the IECC and the IgCC offer two distinct paths to determine roof and wall R-value, one based on International Code Council (ICC) standards and one based on American Society of Heating, Refrigerating and Air Conditioning Engineers (ASHRAE) standards. In past code editions, the R-values resulting from the ICC and ASHRAE paths frequently were identical, but recent editions of I-Codes and ASHRAE standards contain a number of significant differences in R-value requirements. An important change to be aware of is that the 2012 IgCC no longer contains the traditional roof and wall R-value tables used in previous codes. As a result, it may be difficult to determine exactly what is the correct roof and wall R-value for a particular new building or renovation project. Although differences in prescriptive thermal values can be found between ICC and ASHRAE standards, it is important to recognize that ICC and ASHRAE are working together closely to make energy codes as consistent as possible. In fact, ICC and ASHRAE jointly signed a Memorandum of Understanding in 2006 formally recognizing their mutual contribution to advancing building safety and energy efficiency and committing to explore ways to optimize codes and standards development. As a result of this mutual agreement, recent energy-related I-Codes formally reference their corresponding ASHRAE standards as equivalent paths to code compliance. In the case of the 2012 IECC, ASHRAE 2010 Energy Standard for Buildings Except Low-rise Residential Buildings (ASHRAE 90.1-2010) is identified as an equivalent code and design approach, while the 2012 IgCC identifies ASHRAE 2011 Standard for the Design of High-Performance Green Buildings (ASHRAE 189.1-2011) as an equivalent approach. A recap of the I-Code and ASHRAE energy standards, their intended function and their relationship to each other is provided in Table A. As illustrated in Table B, minimum R-values for this climate zone vary considerably, even between codes intended to be functionally equivalent. Although it would be reasonable to assume that the R-35 required by an above-the-code standard such as ASHRAE 189.1 would be higher than the R-20 or R-30 required by minimum code standards such as the 2012 IECC (R-30) or ASHRAE 90.1 (R-20), it is difficult to understand why the R-values in the two minimum code standards differ so significantly. Unfortunately, the R-value differences between the 2012 IECC and ASHRAE 90.1-2010 appear to be related to procedural problems and timing differences occurring during the development of these standards. In the case of ASHRAE 90.1, a successful appeal by the glazing industry involving prescriptive thermal values for windows effectively delayed the inclusion of prescriptive thermal value tables in the 2010 edition. As a result, ASHRAE 90.1-2010 was published with a reference to the thermal value tables in the previous edition, so the R-values remained low (R-20). Although it appears likely that ASHRAE will publish revised thermal value tables this spring with roof and wall R-values much closer to the current 2012 IECC, the current discrepancy serves as a good example of the differences that may occur due to separate development processes. “The building thermal envelope shall exceed the requirements of Tables C402.2 and C402.1.2 of the International Energy Conservation Code by not less than 10 percent. Specifically, for purposes of compliance with this code, each U-factor, C-factor, F-factor and SHGC in the specified tables shall be reduced by 10 percent to determine the prescriptive criteria for this code.” (2012 IGCC Section 605.1.1)"
Although this instruction is reasonably straightforward, it is important to note that R-value (or R-factor) is not mentioned. Instead, the mathematical reciprocal of R-value (U-value or U-factor) is referenced. This means that in order to identify the minimum R-value for a roof or wall assembly under the IgCC, the designer must first identify the minimum U-value in the 2012 IECC for the roof or wall assembly in question, reduce it by 10 percent, and then calculate the reciprocal R-value. As an example, in the case of the Climate Zone 6 example in Table 1, the minimum U-value for a roof with insulation above deck in Table 402.1.2 of the 2012 IECC is 0.0320. Next, applying the 10 percent prescribed reduction results in a new IgCC U-value of 0.0288. Finally, converting the IgCC U-value of 0.0288 into its reciprocal R-value results in an IgCC R-value of 35.7. A detail of the calculation is illustrated in Table C.
For a wall or roof assembly with insulation located only in one place within the assembly, calculating the appropriate IgCC R-values is relatively simple, even if a little confusing initially. However, for walls or roofs with insulation located in more than one place within the assembly, the calculation may become more difficult. 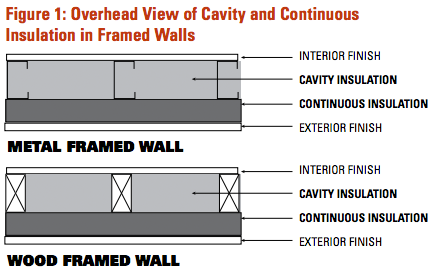 As an example, wood and metal framed walls in almost all climate zones now require two separate locations for insulation: (1) insulation installed within the wall cavity (i.e., between the wood and metal studs), and (2) continuous insulation (referenced as “ci” within the 2012 I-Codes) installed on the exterior side of the wall cavity. Examples of cavity insulation and continuous insulation in wood and metal framed walls are illustrated in Figure 1. A major problem in calculating the IgCC R-values for insulation in framed wall assemblies involves the physical limitation of the cavity portion of the wall. Because the depth of this cavity is determined by the size of the standard framing members (typically 3 ½-inch or 5 ½-inch wood or metal studs) and because current minimum IECC standards for cavity insulation effectively reach the maximum value possible for the established cavity depth, the required IgCC increase in R-value usually must be applied only to the continuous insulation portion of the wall. As an example, a wall framed with two-by-sixes incorporates a 5 ½-inch cavity typically insulated with R-20 glass fiber or similar material. Because the IECC minimum R-value for a wood-framed two-by-six wall in Climate Zones 1 through 5 is R-20, the increase in R-value (or decrease in U-value) required by the IgCC can only be applied as continuous insulation on the exterior side of the wall without increasing the width of the studs. In this case, the necessary additional R-value is approximately R-2, which can be achieved by installing a layer of continuous insulation board to the exterior side of the wall framing. Finally, the calculation of IgCC R-values involves an additional confounding factor. The R-value tables in the IECC are not derived as exact mathematical reciprocals of the corresponding U-value tables. To illustrate using the previous example of a roof with insulation above deck in Climate Zone 6, the IECC R-value table lists a value of R-30, which compares to an exact mathematical U-value reciprocal of U-0.033. However, the corresponding U-value table in the IECC lists a value of U-0.032, which is slightly lower than the mathematical reciprocal. This difference can be attributed to assumptions regarding effective thermal values of other elements of the assembly such as air films and framing members which can increase or reduce overall U-value. Another way to explain this is that the IECC and ASHRAE U-value tables provide values for the complete assembly, while the IECC and ASHRAE R-value tables provide values for the insulation within the assembly. This means that although a simple mathematical conversion of reducing IECC U-value by 10 percent will yield the correct IgCC U-value, a similar mathematical conversion of the new U-value to the new R-value will not necessarily yield the correct result. Fortunately, this difference between U-value and R-value is addressed in Normative Appendix A of ASHRAE 90.1, which provides adjusted equivalent insulation R-values for assembly U-values. As a result, the actual determination of insulation R-value for the IgCC requires an additional step of looking up the wall or roof assembly in ASHRAE Normative Appendix A and extrapolating the required insulation R-value from the listing of equivalent R and U values listed in the appendix. Again, drawing on our roof example in Climate Zone 6, the mathematically calculated R-value reciprocal of the IgCC U-value is R-37.7. However, an interpolation from ASHRAE 90.1 Normative Appendix A yields a slightly lower R-value of R-37.5. In this case the minor difference of R-0.2 can be attributed to air films above and below the roof assembly.